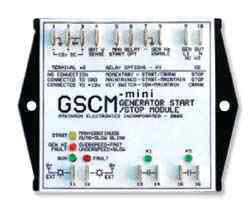 This generator start controller is optimized for use with OutBack inverters. It supports three types of 3-wire gas-generator control: momentary, maintained or ignition. It has a fixed crank time and over and under frequency shutdown.